MIAMI — When the Miami Heat ended practice Sunday, Dwyane Wade went home to his sons. That will be a regular event going forward. Ending a long and often-vengeful fight, a Chicago court has awarded Wade sole "care, custody and control" of his two sons. The boys arrived in Miami on Friday, shortly after the ruling was filed, and Wade told The Associated Press that "a huge weight is off my back." "My life changed in a huge way," Wade told the AP. "Mentally, I've been preparing for it for over a year now. To me, it's bigger than that. For me, it shows a lot of people that you need to fight to be in your kids' lives sometimes. You fight until you can't fight any more. That's all I was trying to be, a father in his kids' lives." Wade did not immediately announce the decision after receiving word Friday, trying to make sure that his sons fully understood what it meant first. Teammates, informed of the ruling in a locker room meeting on Saturday after Miami's victory over the Memphis Grizzlies, gave him a rousing ovation. Wade had one of his finest all-around efforts of the season Saturday: 28 points, nine assists, five rebounds and five blocked shots. It may not have been a coincidence. "I heard the best news I could possibly hear," Wade said. "So I was like, 'I'm going to go out there and play free and enjoy it.'" Wade's divorce was granted last June, after a lengthy separation. The financial portion of the divorce remains unsettled. The boys' mother, Siohvaughn Wade, will have what the court described as "regular parenting time" on alternating weekends in Miami, as well as several other times during the year, including Mother's Day. Dwyane Wade has also repeatedly said that he wants his sons to have healthy relationships with their mother. Still, the 102-page ruling had some sharp words for Wade's ex-wife. "This court finds that (Siohvaughn Wade) has embarked on an unstoppable and relentless pattern of conduct for over two years to alienate the children from their father, and lacks either the ability or the willingness to facilitate, let alone encourage, a close and continuing relationship between them," read a portion of the ruling entered by Judge Renee G. Goldfarb. Wade's attorney, James Pritikin, said the custody trial "was one of the longest ever in Cook County history." Wade filed the motion asking for sole custody nearly a year ago, though the legal tussle has gone on considerably longer. He and his ex-wife separated in August 2007 and it took Wade years to get the divorce, a process that was slowed by his ex-wife often changing attorneys. He also sued Siohvaughn Wade for defamation after she made unfounded allegations against him in 2009 — claims she eventually withdrew. More claims against Dwyane Wade followed during the custody case, including that he was abusive to his children. The court found them all to be baseless. "The court agreed the best home is with Mr. Wade and that he is also willing to foster a relationship with the children's mother," Pritikin said. "I know he will continue to be a phenomenal parent." The court acknowledged that Wade's schedule as a professional athlete is "demanding," given the rigors of training camp, preseason, an 82-game regular season and then the playoffs. "Is every day the same? No. Is it consistent? No," Goldfarb's ruling read. "But, to posit that (Dwyane Wade) does not have the time to be a primary parent is incorrect. He has the time if he makes the time." Wade said all the measures are in place for as smooth a transition for his sons as possible. A school for the boys has been selected, and a plan for child-care was presented to the court, which found it acceptable. "We had to have that, nanny care, everything already booked and planned out," Wade said. "That's the easy part." The court ruling also had some other interesting items, including Siohvaughn Wade's contention that Dwyane Wade could have found employment in Chicago, where she has lived with the boys. Wade met with the Chicago Bulls twice last summer when he was a free agent, but according to the ruling, Bulls owner Jerry Reinsdorf never met with Wade, nor did the team ever present the 2006 NBA finals MVP with a contract offer. The ruling also states that Wade is on the U.S. roster for the 2012 London Olympics. Wade played with the U.S. team at the Athens Games in 2004 and the Beijing Games in 2008, but has not yet said publicly if he definitively plans to play at the London Games. 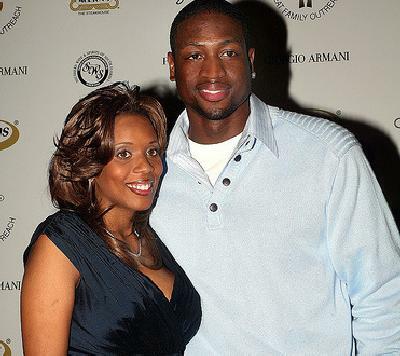 Wade told the AP that the waiting for the ruling has been difficult, and expressed again Sunday a desire for his ex-wife to "play a healthy role" in the boys' lives. "I'm not going to say, 'OK, I won,'" Wade said. "I think them living here, being here, it's a great opportunity for them and I'm looking forward to it for them, to grow up with me and us learning together, how to be father-son. So I'm excited." He did what any *good* father would do_fought for and, by the grace of God, WON sole custody of his children. Black men being stellar examples of Loving fathers...I love it!